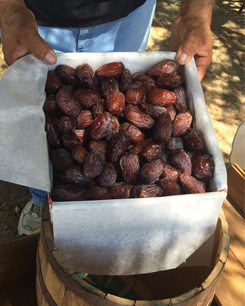 At San Marcos Date Farm, we grow delicious dates in Desert Hot Springs, California, which has the ideal climate for growing the highest quality dates in the world. Our goal is to ship online orders for dates and other treats to customers all around the country. There are many people that enjoy untreated, natural foods that are looking for reliable sources to order from. For that reason, our dates are grown pesticide free. Contact us today to order your preferred type of date from our wide selection or purchase a variety pack to experience every type of date we grow on our farm. Our date farm business has been passed down for three generations. Julian Juarez started the farm and has been working in the orchards since 1957. It is his experience and knowledge of the production of Medjool dates that has led to our success. Now, Marcos Juarez and his family strive to produce a product of the finest quality for you to enjoy. We are proud to say that our product is grown right here in the Coachella Valley and that we use all-natural fertilizers in our soil.